This was my first dish using fish sauce(that time, Sept 2011). I’ve never used fish sauce before. And not long before I saw this recipe, I bought myself one small bottle. Some are made from squid, some from anchovies and this bottle I’ve got, is made from pomfret. Experienced fish sauce users, any difference between those that I mentioned? I just have no idea. But one thing I know, it definitely taste more pleasant than fish sauce that comes from China. That is toooooo fishy for me. I adapted this recipe from Echo’s Kitchen, and the only major difference I did was adding in some homegrown lemongrass. Poor lemongrass bush, I’m tearing it apart faster than it can reproduce. If you have all these plants at home, I’m sure you can whip up this appetizing steamed fish in no time. I know a lot of people have calamansi trees at home, leftovers from Chinese New Year, lemongrass and even bird’s eye chilli. But I don’t have a calamansi tree at home right now, I’m waiting for Chinese New Year to get mine. Because I only have 6 fruits at home, and that wasn’t enough for this dish, I added in some lemon….. frankly, lemons don’t taste as good as calamansis in this dish. When I first used calamansi… wow, the taste was fabulous, then as I adjust the taste, I had to use lemons as I ran out of calamansi and then the flavor was somehow, not as good, from a citrus point of view. So, my personal opinion is, use all calamansi and it’ll be phenomenal, like Echo says it’ll be. 2. Mix garlic, chilli, calamansi juice, sugar, fish sauce, and salt together. Stir until sugar and salt dissolves. Taste. It should be slightly oversalted, sourish and mildly sweet. (Once it cooked, the saltiness will be reduced and the ‘sweetness’ will be enhanced by the fish) Adjust as needed. Let it sit for 5 minutes and taste again. Take note that changes in flavor might occur as the garlic gets “pickled”. 3. Stuff some lemon grass and some of the garlic mixture (no liquid) into the belly of the fish. 4. Put 1 Tbsp of the garlic mixture in your steaming dish, on the spot where you will place your fish. 5. Place fish in steaming dish and spoon garlic mixture over. Sprinkle top with sliced lemongrass. Pour oil over the fish. They are very scary de, all withered and dried, can just be ressurected one la. I tried before. 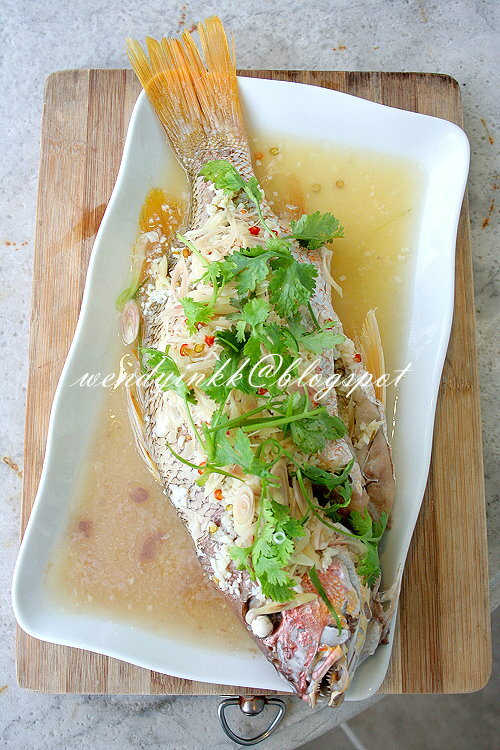 Hi Wendy, yummy steamed fish with so simple ingredients, my favourite. Must try this when my hubby brings back the fish from his fishing trip. Thanks. Just "kay poh" actually both sauces are the same (fish sauce). The squid is just the brand only. Totally agree with you that calamansi beats lemon hands down on the taste front in these type of sourish dish. Love this dish,i make it often with lots more of calamansi haha! my hubby can't take too sour, he said his tongue will go numb, hahaha. I guess the flavour needs to be balanced, and it's enough, Maybe you made a lot of gravy, is it? This recipe is definitely for keeps. Thanks for another wonderful recipe ! 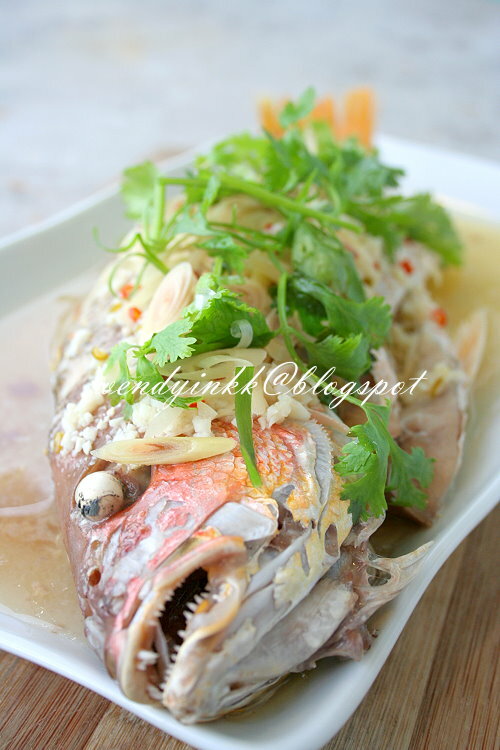 Hi Wendy, I finally tried this steamed fish. Really appetising [khai wei] and easy to prepare. Thanks for sharing and I'm linking your post to mine. With lemongrass, it is more fragrant, too. 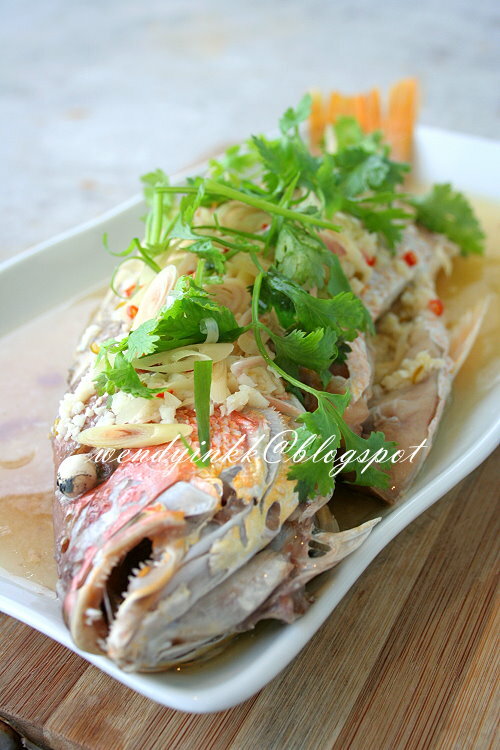 Hi, i am on 'puasa ganti' today and thought of having steam fish for buka puasa, and luckily i came across your blog ! very nice recipe indeed, and i have all the ingredients at home.